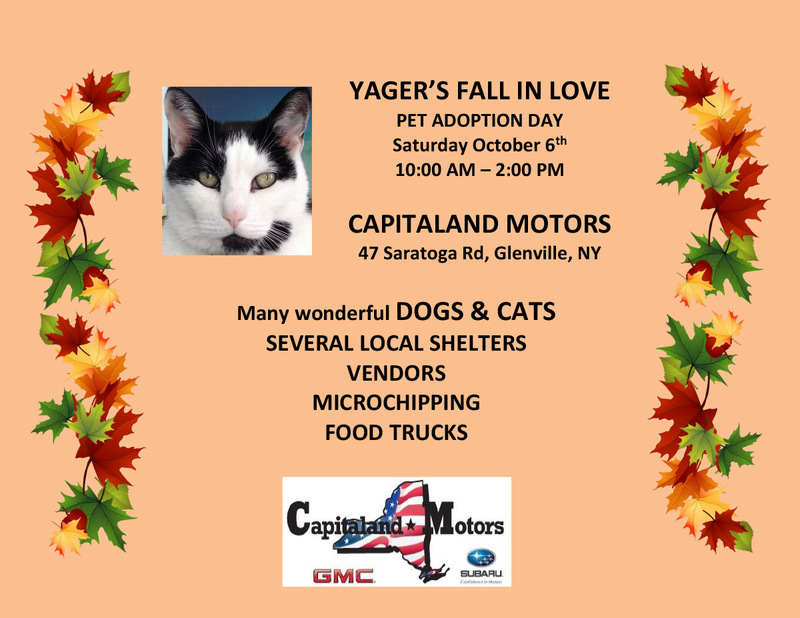 Capitaland Motors would once again like to invite you to our annual pet adoption event, Yager’s Fall in Love. Yager was a wonderful kitty, who gave us years of love and companionship to say the least. As is often the case with pets, you might say he rescued us as much as we rescued him. In memory of our late feline family member, each year we host this adoption event at our dealership, in hopes that other kitties and four legged friends find the forever homes they so deserve. Stay tuned for a full list of rescues and vendors that we expect in attendance. If you are a rescue organization, or pet related vendor who would like to attend, please contact us to reserve your spot indoors or outside. There are no table fees, so we do expect spots to fill up quickly. Thank you everyone, we hope to see you there! !